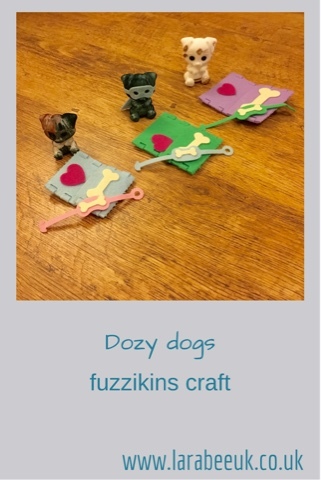 We were recently sent the dozy dogs fuzzikins set to make. 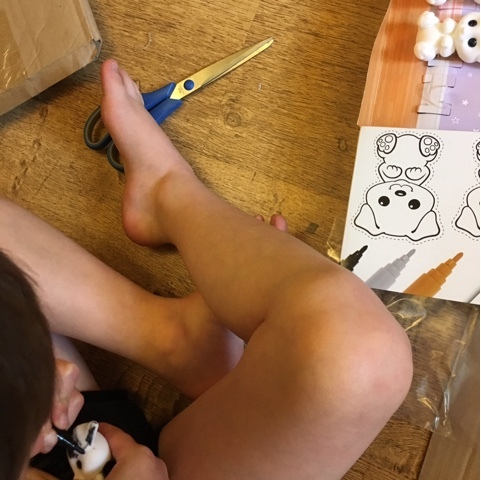 T loved the little dogs and named each one after family pets and wanted to colour them in to match. Well, although T got stuck in and was happy as Larry colouring in his dogs, I must admit I was slightly dubious. 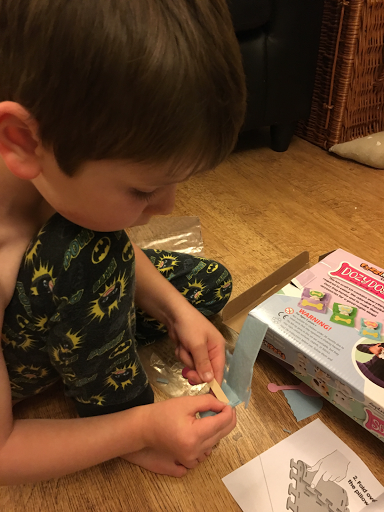 He seemed to get the pen all over him and made far more mess than the box suggested or in fact other reviews I'd seen! 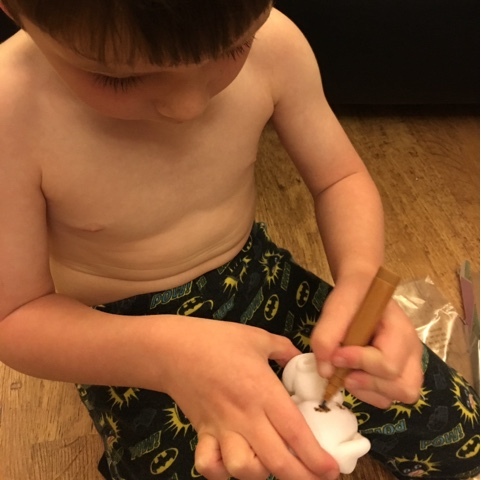 The pen did come off in the bath luckily, but this little quiet time activity before bed actually turned into an extra 20 mins on bedtime as T needed a good soak to clean it off. Despite me being slightly frustrated by this product, T really liked them, he didn't see the colouring to be difficult and he particularly liked the superhero cape and mask which fitted our dog 'Taz', since we did this craft he has had lots of fun dressing his superhero dog! T actually didn't find making up the sleeping bags too difficult and quite enjoyed poking the tabs through. Although they did take quite a long time and he did get a little bored. I'm not sure if it was just us or whether these really are a bit difficult for smaller children. 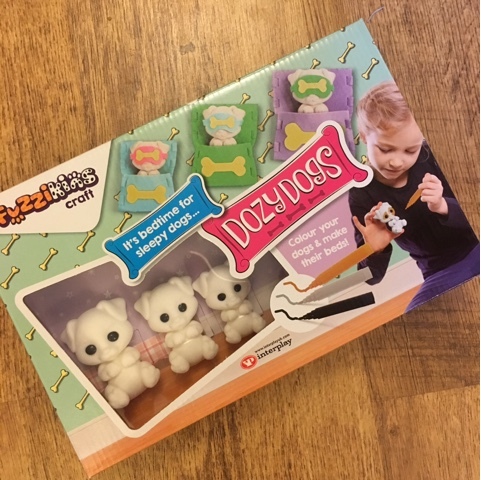 Dozy dogs is suitable for age 4+, but T is nearly 5 and still found these tricky. 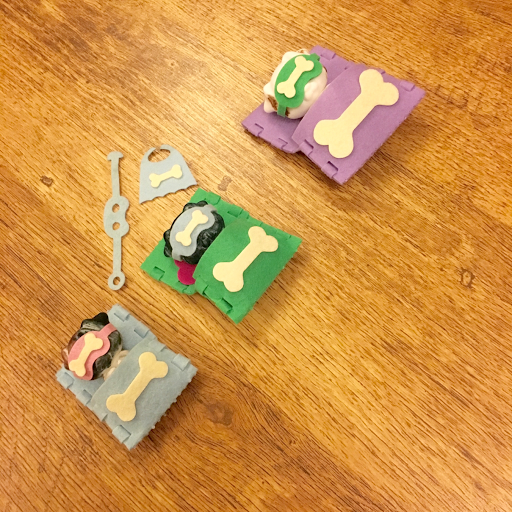 T's dogs now sleep on a chair beside his bed and he is playing with them quite a lot despite the difficulties he had doing this craft, he has really enjoyed them. Disclaimer: We were sent this item in return for our honest review. All opinions are our own. Oxbridge Masters help students by offering custom coursework writing service. We do coursework writing help effectively to get you higher grades. When you ask us to Do My Coursework, we write high grade papers that are result oriented and you will get high grades in your exams. Oh, so now I know what should I buy for my nephew for my next visit. 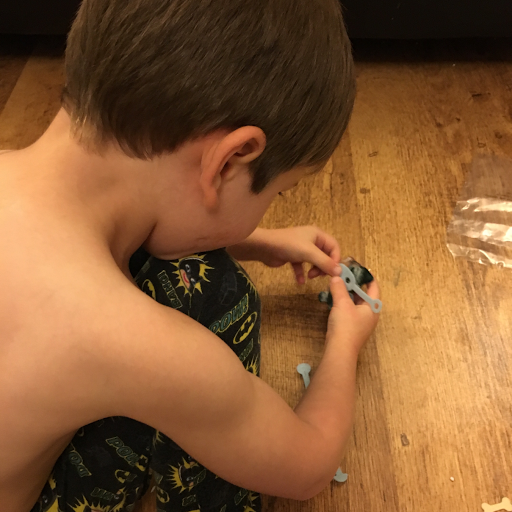 He's a big fan of Paw Patrol) I think he'l could paint those figures like the characters of the cartoon. He'll definitely like such present. And I would like to get some discounts by college essay writing services as a present for me.